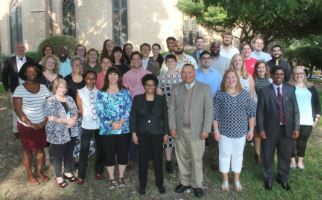 Austin (January 31, 2018)— The Reverend Dr. Valerie Bridgeman and The Reverend Dr. David Gambrell were honored with the 2018 Austin Seminary Association’s (ASA) Awards for Service, citing their dedication and outstanding service to the church and community. Begun in 1975, the awards are given each year during the ASA Annual Meeting and Banquet. Award recipients are nominated by their peers and community and selected by the ASA Awards Committee and Board. The Reverend Valerie Bridgeman, of Delaware, Ohio, graduated with a Bachelor of Arts in Communication and Religion from Trinity University, received her Master of Divinity from Austin Seminary in 1990, and earned the PhD in Biblical Studies with a concentration in Hebrew Bible in 2002 from Baylor University. Bridgeman has taught at Memphis Theological Seminary and Lancaster Theological Seminary, and since 2015 she has been Associate Professor of Homiletics and Hebrew Bible at Methodist Theological School in Ohio. She was appointed Interim Dean in 2017. Bridgeman is also founding president and CEO of WomanPreach! Inc.—a non-profit organization whose mission is to bring preachers to full prophetic voice. Valerie Bridgeman’s list of accomplishments include co-chairing the American Academy of Religion’s steering committee of The Bible in Racial, Ethnic, and Indigenous Communities; serving on the nominating committee for the Academy of Homiletics; serving on the Society for the Arts in Religious Theological Studies steering committee (2011-2014); and serving as the co-chair of African American Biblical Hermeneutics and Women in the Biblical World Section for the Society of Biblical Literature. She was inducted into the Society for the Study of Black Religion in 2007 and into the Martin Luther King Jr. Collegium of Scholars and Preachers at Morehouse College in Atlanta, Georgia, in 2010. Additionally she has served on the Faculty Development Advisory Committee for the Association of Theological Schools (2012-2014), the Out in Scripture editorial advisory board (2007-2010), and Perspectives in Religious Studies Monograph Series editorial board (2004-2006). She is currently on the Y. A. Flunder Foundation Advisory Board, the Samuel DeWitt Proctor Conference Board of Trustees, the Black Theology Journal editorial board, and the Journal for the Bible and Transformation editorial board. The Reverend David Gambrell, of Louisville, Kentucky, graduated with a Bachelor of Arts in Anthropology from Louisiana State University in 1994, received a Master of Divinity from Austin Seminary in 1998, and earned the PhD in Liturgical Practices from Garrett-Evangelical Theological Seminary in 2013. After seminary he served as Associate Pastor at Saint Andrew’s Presbyterian Church in Austin, Texas, and worked as the Creative Director in the Office of Communications at Austin Seminary until 2004. 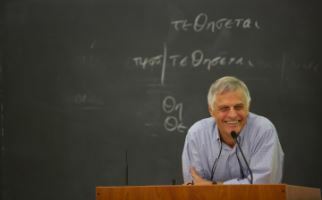 His list of accomplishments include serving as coordinator of revisions to the Presbyterian Church (U.S.A) Directory for Worship, liturgist for the Summer Worship Series at Montreat Conference Center, faculty member of spirituality for the Presbyterian Church (U.S.A) Board of Pensions CREDO program, adjunct faculty for Austin Seminary’s Doctor of Ministry Program, and representative to the Consultation on Common Texts. He has also served in many capacities for the Presbyterian Association of Musicians Worship and Music Conferences at Montreat Conference Center. Currently David serves the Presbyterian Church (U.S.A) as the Associate for Worship in the office of Theology and Worship, where he has served as co-editor of a new edition of the Book of Common Worship (forthcoming, 2018) and an advisory member of the committee that developed the 2013 Presbyterian hymnal, Glory to God.